Here's a really unusual- and hard to find- chosen card prediction effect. Our suppliers don't carry this one anymore. 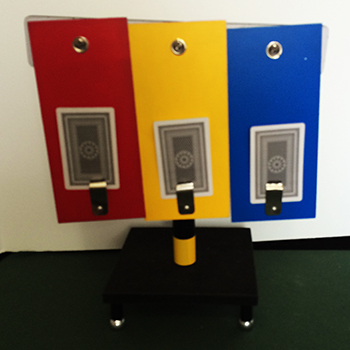 Show a stand with three panels- red, yellow and blue. You remove 9 cards from a shuffled deck and clip three cards to each of the three panels. Let your spectator freely select two of the panels to be eliminated. Take the three cards off the remaining panel, and put one card on each panel. Again let your spectator eliminate two of the panels. That leaves the remaining panel with the spectator's freely chosen card. 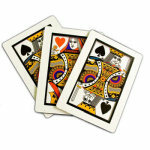 When the three panels are flipped over, a giant replica of the selected card is created! The stand is made of wood, the panels are cardboard. Stand measures about 14.5" high by 11" wide. Comes with all cards needed. 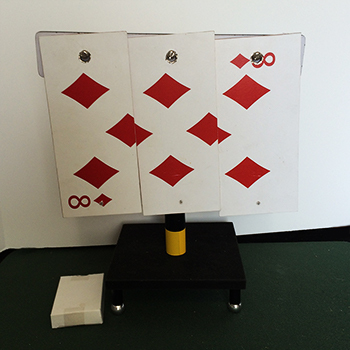 This particular model reveals the Eight Of Diamonds.